This section is for your Skytop story........about a Skytop you once had, or a Skytop you have now......or about the Skytop that 'got away'. NEW!! NEW!! NEW!! NEW!! NEW!! NEW!! NEW!! NEW!! NEW!! NEW!! The first SDC International Meet I ever attended was in Springfield MO in 1985. Two cars still stick in my mind – Lee & Mary Blair’s silver 1962 Daytona Skytop with its tasteful custom touches, and John Metzker’s outstanding 1963 Daytona Skytop with R2/4-speed. Quite a while back, I sent John a picture taken at that meet of him sitting in his Skytop, and asked for more information on the car. John graciously provided the following ‘Skytop Story’ about this car. Many thanks to John for taking the time to put this down ‘on paper’, and my apologies for taking so long to get it added to the website. 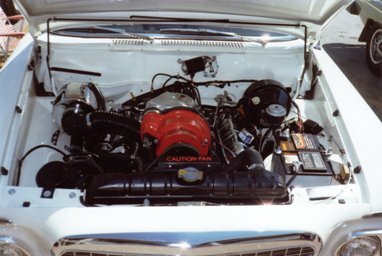 Here are a couple of pictures taken by your Webmaster at the 1985 SDC International Meet in Springfield MO. Yes, that cool dude is your Turning Wheels Co-Operator Advisor for Automatic Transmissions John Metzker sitting in his recently finished Skytop! You contacted me some time ago, to inquire about a Skytop I once owned, and I promised I would send you its story; here it is! The car in Question, a 1963 Daytona Skytop, with the R2 / 4 speed "super package", Ermine white with the Chestnut/white interior, that you saw in 1985 at the International Meet in Missouri, had a very humble beginning. It was sold new at Rancho Motors Studebaker in Hollywood, California to a Mr. W.O. Teeter, in 1963. I knew this because his name was written on the Owners Manual that I received with the car when I purchased it. It had little significance to me at the time; however, some years after I sold the car I connected with him by an odd quirk of fate. Being a Co-Operator contributing editor for Turning Wheels, I receive mail from all over the country. One day I received a communication from a fellow somewhere in the south; his last name was Teeter and he used just his first and middle initials ahead of it like the name I remembered on the Owners Manual. Although the initials weren't the same, I thought because the format and last name were the same, there had to be a connection. So, included with my response to his technical question that involved a '65 Cruiser, I asked if he knew a person of similar name that had once owned a Skytop. A week or so later I received in the mail a letter from W.O. Teeter himself! It seems that his son was the person who had contacted me initially. Mr. Teeter was quite surprised to learn of the cars continued existence and was able to fill in the blanks of its history prior to entering my life. He and his family resided in Riverside, California in 1963. He worked in L.A. and this is how he came to purchase the car. He needed an economical car to commute to work and back. The Skytop fit the bill; the overhead valve six and automatic it came equipped with was just right. It had a bench seat and no radio, so the price must have been attractive. He told me they used it as a family car up until 1972. By that time they had moved to Cypress, California, a suburb of L.A., in Orange County (think Disneyland). I live in a neighboring city, and this is how the car became known to me. Sometime toward the end of 1971, the rear end gave out on the car. They took it to their local mechanic, who worked out of a filling station (remember those days?). It seems the cost was more than they cared to spend, so they received permission to park it at the station with a For Sale sign on it. Enter owner number two, Jim Holsonbake. 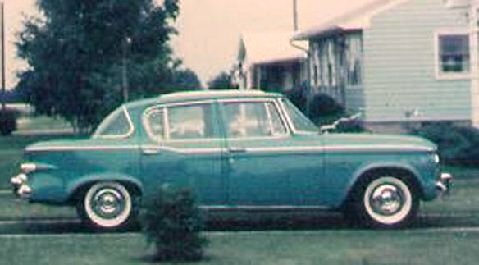 Jim was, and still is, my life long best friend and Studebaker buddy. He, like I, has Studebaker fluid in his blood. It seems as though his wife of the time was, as are all good Studebaker wives, deftly trained in the art of finding and reporting Studes for sale. Such was the case when she came home one afternoon and told Jim of the nice looking Lark she had seen for sale. She wasn't able to tell much about the car from the street, but she did say that it looked as though it "……..had a blanket or some rags on the roof"? Jim purchased the car for a song, put a used rear end from a wrecking yard under it and had a very nice original driver. Never content with the status quo, and in part because I was putting the finishing touches on a R2 4-speed conversion in a '63 Regal 2-dr., Jim thought about changing the Skytop to 8 cyl motivation. This became reality with the purchase of a wrecked '63 R1 4-speed powered, disc brake equipped Daytona, with power steering, TT rear end, but no sun roof. Over the next year the conversion took place; however a Powershift transmission was substituted for the 4-speed. The result was a nice car, but the factory paint was showing its age, the green bucket seats from the wrecked car were tattered, not to mention that they clashed terribly with the original Chestnut, and the original sun roof was in need of replacement. Jim drove it infrequently over the next several years, and around 1980 or 1981 He began downsizing his fleet. I had sold all of my cars in 1978 to help with the down payment on my first house. As I had since recovered from that purchase, and was looking for a new Stude project, Jim made me an offer I couldn't refuse on not just the Skytop, but a VERY rough Avanti (my first). Since the Lark was running, and just needed a "little fixing up" (famous last words), the Avanti was put in storage and a "light" restoration begun. Nothing fancy, just a nice driver. What you saw in Missouri The R1 was converted to R2 specs (fairly easy) and the Powershift was removed and replaced with a 4-speed and Hurst shifter (only non-stock piece on the car). I installed a 160 speedo & factory tach, as well as the rear swaybar and traction bars. The traction bars (radius rods) were the most involved part of the upgrade. The frame brackets were welded to the top of the frame prior to the body being installed. To do this after means removing the body, or cutting access holes in the floor. To me, cutting the floor was not an option, so, off came the body! The springs were replaced with HD units, and the exhaust system replaced, including the optional R3 headers. Phil Brown took the time to locate a complete NOS chestnut interior from Newman & Altman for me, and most of the outside trim and moldings were NOS as well. The top was replaced in black (originally white) as I felt it would be easier to keep looking nice. My goal was to make this car as I would have ordered it new, had I been old enough, and financially able, in 1963. Turns out, I really couldn't afford it in 1985 either. The project got away from me, and to repay MasterCard, I was forced to sell it. That is why it was at the meet when you saw it. Ray Miller, of Elkhart Indiana, a well known collector, purchased it at the end of the meet. I delivered it to him on my way home, and he displayed it in his private museum for several years. So, after 22 years, she was back home. In the '90's, Ray sold the car to a fellow in Georgia, in the Atlanta area. A few years after, I heard that it had sold again, and at that point I lost its whereabouts. This past summer , Jon Myer (Myer's Studebaker Parts, Duncan Falls, Ohio) came for a visit to California after the International Meet. He and I became close friends in the early '70's when he lived in L.A. He and I were reminiscing, and the Skytop came into the discussion. He knows the current owner, and where he lives. He says that she is being well cared for, and gets delivered to shows in an enclosed trailer! Ironically, Jim Holsonbake, who now lives in DeSoto IL, has another Skytop, a very nice, original, '63 Cruiser. It is black, with a beautiful red broadcloth interior. It was sold in Illinois new, came to Downey California in '66 and was purchased there by Jim In the '80's. It went back to Illinois with him about four years ago. 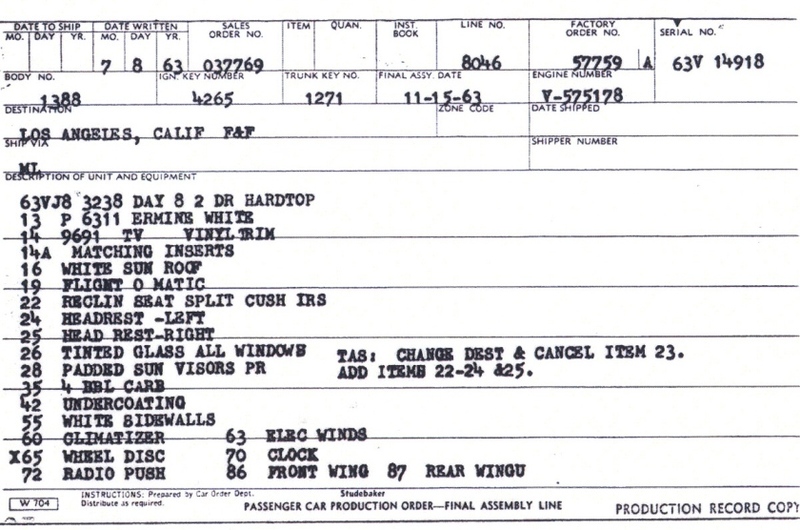 Webmaster's notes -- The Registry lists the current owner of this car as Gary Williams of Ohio. More pictures of this beautiful car can be seen here on the Surviving Skytop page, about 2/3rds of the way down the page. The title said "Want a 4-door Skytop??" The message was from my young friend Matthew Burnette. Naturally I opened that immediately! 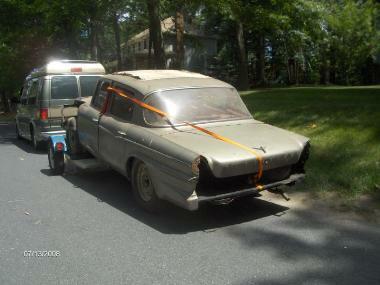 It seems Matthew had come upon a 62 Lark Regal, 4 door sedan, in mid-restoration for sale. He had been interested, but had decided to pass, since it was in Boston, MA- a long haul from his home in GA. Those that know me know that I have a particular affinity for Larks. I also am building a 62 2dr. HT Skytop, and have made no secret of the fact that I love the Skytop option. Being that I hail from central New York State, a mere 6 hours from Boston, Matthew thought I might be interested. Of course, he was right on the money- to say I was interested was an understatement! The e-mail told of the above car. It had been in storage since 1989, partially restored, and included many NOS parts. The owner had lost his storage, and the car had to go ASAP. I took the information, thanked my buddy, and wrote the owner. It took a few days, but Mack, the seller, did eventually get back to me. He had owned the car for years. In the 80s he began to amass NOS parts for the restoration. He had cut out the rusted floors and trunk floor and replaced them with all new panels from Classic Enterprises. The underside and very clean frame had been coated with POR-15. Once the floors were done, progress stopped there, and held there nearly 20 years. Mack always kept it safely indoors, and made the effort to occasionally turn the engine to keep it free. He rattled off a list of parts with it that was quite impressive! Of course I asked for pictures; Mack didn't have any recent photos, just a few black and white shots taken in the garage- not very descriptive. The price was in my opinion fair for what the car is, so although I would have preferred a few more pictures, a price was agreed upon, we hitched up the trusty tow dolly, and headed to Boston. We followed the direction of the GPS to an address just a few blocks from Foxboro Stadium. As we pulled in we were greeted with a smile and a handshake from Mack. He escorted us to a small two-bay garage with open doors. As we approached I recognized the back end and decklid of a Lark, sans rear panel. There she was! We walked in and I was greeted by a Metallic Silver Deluxe sedan. She's something of a Plain-Jane: 259 V8, manual trans. without O/D, red vinyl reclining bench, no PS or PB, radio delete. The only two options that jump out at you are door panels with the pouches (Cruiser?) and of course that Skytop! The Skytop registry shows it to be just one of THREE known to exist! It took about 5 seconds for me to realize she had to come home with me! So Mack and I cleared some boxes off it and rolled her outside. We re-hung the removed doors on the driver's side, and began loading the parts. There were NOS front and rear panels, fenders and inner fenders, and RR fender. We loaded the bigger panels in the van, and the smaller items in the car. As Linda and I loaded the boxes, Mack repeatedly pulled boxes off shelves containing more goodies, all NOS: Seat covers, seat belts, headliner, trim pieces, Hill Holder, etc.- all still in their original boxes! It was overwhelming. Anything that would fit the car was pulled from the garage and loaded up; the interior of the car was full, as well as the back of the van! She was pushed onto the dolly and secured, and we went inside to wash up and exchange money for title. Mack produced the title, two sets of original keys, the Production Order for the car, and a big stack of receipts for parts bought and lovingly accumulated over 20 years. The trip home along I-90 was safe and uneventful, save for dust and the occasional shred of the deteriorated top material blowing away. Upon arrival at home, all the parts were removed and cataloged, and stored away. Upon closer examination, the odometer shows 54K miles. Mack believes that to be original miles; he bought the car from the original elderly lady owner. The engine compartment is very clean, complete, and original- the cowl tag still had the "Sky.top" streamer still in place- rare indeed! That tag is currently removed, and I am working with a machinist friend to try and duplicate the unique typeface for others. Another interesting aspect of the car is the original dash- it's in mint condition in its original bright red, single color, no padding. I've never seen one exactly like it! Currently the car is securely stored away inside, safe from the nasty Central New York winters. Plans are of course to treat her to a complete top-notch restoration. If necessary she may eventually pass to a new owner who can finish her, since I currently have other Studes ahead of her. Most importantly, she's safe from harm, the crusher, and the cannibals; that's only right for a car this significant and special! Addendum: Robert sold his 4-door Skytop to Joseph Barrier of Omaha NE in 2009. Robert sold his 4-door Skytop to Joseph Barrier of Omaha NE in 2009. To find out more, and for more pictures, go to the Surviving Skytop page here and scroll down approximately 2/3rds of the way!! My grandfather had worked in a Studebaker garage in Garden Grove and Visalia, CA. before I was born. I remember stories he had told me about the 1941 Studebaker Land Cruisers that he had restored in the 40's & 50's, claimed that all of them were the best cars he had owned. I know he had restored 14 1941 Land Cruisers plus a 52 Commander and claimed that the 39's would draw blood just looking at them; I assume he had bad experiences with the 39's. 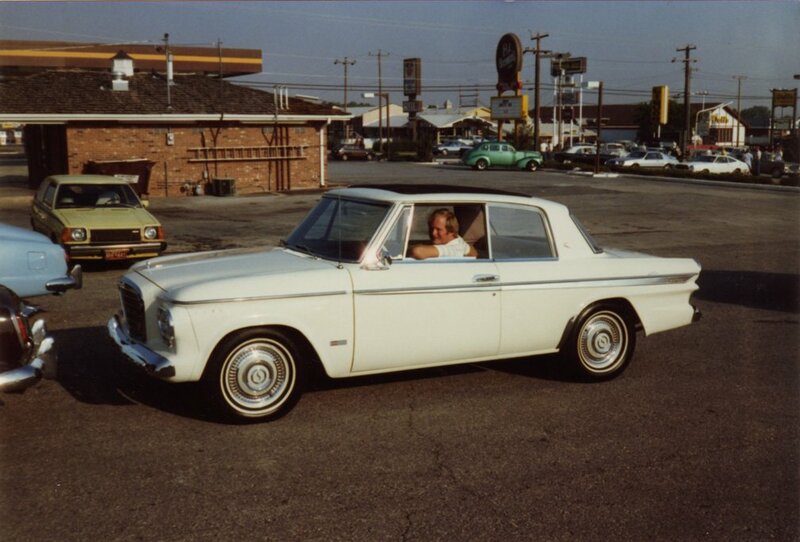 My father also into Studebakers had a 63 Avanti while I was in high school and a 54 Commander HT that he still owns. Anyway, after my grandfather’s death I started to think it would be nice for me to start a car project. My first attempt was a ‘63 Chevy II, it was ok but seemed to be a cheaply built and I got bored with it quickly. After I sold it to my nephew I started looking for a Lark. Not known to me, my father had befriended another Stude owner (Bob Kabchef) in the area. Bob and I met up for an afternoon of searching; he had known where most of the Studes were in the area. I was looking for a 60's vintage like Bobs ‘60 convertible. He had told me about a ‘63 Daytona Skytop in the area, I liked the ‘63's but knew nothing about Skytops. We went to where the car was but the owner had moved, and it was not found. About a month later I ran across a ‘64 Commander 2 dr V8 with A/C and decided this would make a good project; it only need a minor tune up and became my daily driver. The following year Bob had located the ‘63 in the back of a shop in a nearby town. We made arrangements to see this car; I was excited to see it, the price was right but it was just before Christmas. I told the owner I would come up with the money after the holidays. When I contacted the owner again he was in the process of loading the car onto a trailer. He informed me that some guy had come by with the cash and was taking it the same day. I was upset of the loss but decided it was not the time to have that car and something else would show up. Bob and I stayed in contact over the next few years, bringing up that he had seen the ‘63 in town but could not find the new owner. Finally he had made contact. The car had been changed, the reclining seat with head rest and rear seats had been removed and replaced with some GM seats. The rear end had blown out and a GM rear end was installed, and they were looking to trade for a truck. My truck was not what they was looking for, so again I watched the ‘63 leave without me. After sometime passed I thought I would like a Stude wagon as a project; contacting Bob again he informed me that he had found the ‘63 again, this time in a junk used car yard. That night after work I went by and saw not only the ‘63 but also a ‘60 wagon like I was looking for. I made arrangements for the cars on the spot. The ‘63 started and I was able (with a lot of prayers) to get the car home. The ‘60 on the other hand was missing a transmission and tires. With Bobs help and generosity we were able to get the ‘60 to his place for storage. For the last 10 years I have been collecting parts to for the Skytop and hope to start it right after I finish the wagon. 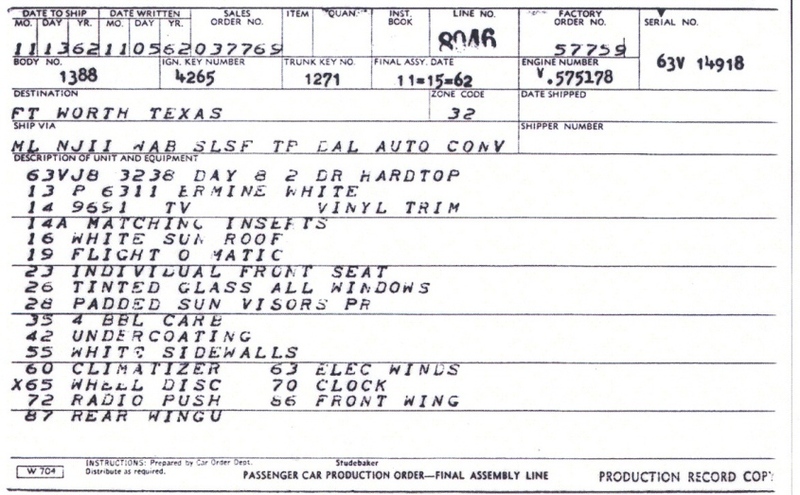 Ron's car is interesting in that it has a two-page Production Order. At some point after it was initially built, the destination was changed from Texas to California, and split reclining front seats with headrests were installed. The Production Orders above can be enlarged by double-clicking them. In 1968 I spent my summer break from college working in Berwick Penna. at the local AGWAY INC farm & feed supply store. The local Studebaker dealer Brown Motors must have been very good at selling Studes because I saw Studebakers all over town. I came to town in a 60 hawk but within a week I traded it in on a 62 GT hawk at the local Buick dealer used car lot. Brown Motors had several Studes for sale, but a ‘64 Hawk Powershift, ‘64 Daytona, 4 speed, ‘63 Avanti R1 were all way out of my price range. At our Agway store, all the employees drove Studebaker’s .The manager drove a 56 President Classic, our truck driver had a 62 Lark 4door and I had my 62 GT. Our regional fertilizer salesman would come to the store maybe once a week drove a 61 Skytop two door sedan. It was a 259 V8 with auto trans., a light tan color with tan interior. He offered to sell me the car for $400.00 but with just buying the GT, there was no way I could afford another Studebaker so I had to pass on it. I think that is the only Skytop I can remember seeing over the years. UPDATED!! UPDATED!! UPDATED!! UPDATED!! UPDATED!! UPDATED!! 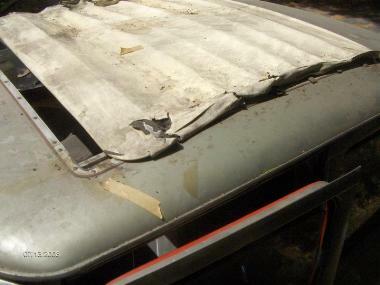 The first Skytop prototype - installed in the 1960 Lark hardtop prototype as described by Ed Reynolds above. 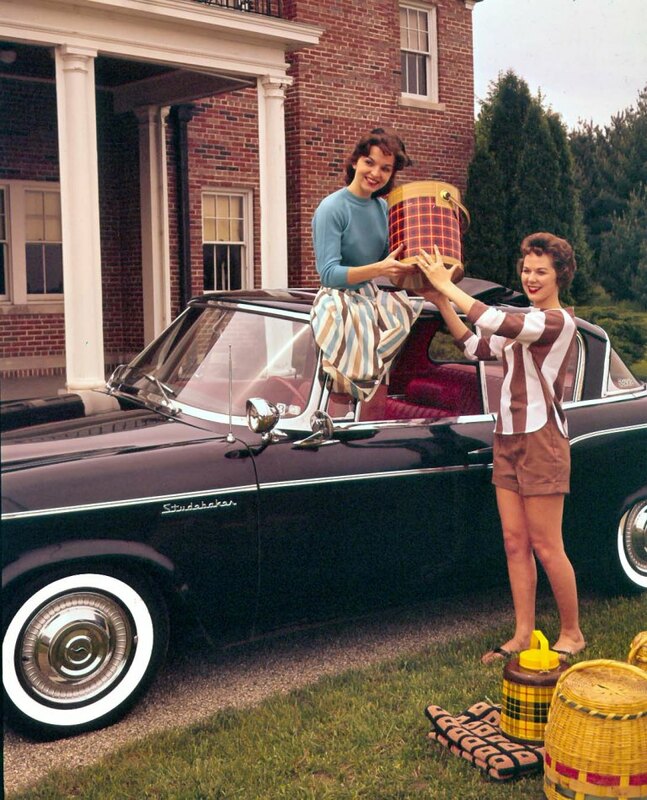 Picture courtesy of Richard Quinn and the Studebaker National Museum. Note the Skotch Coolers shown in the picture - several SDC members collect these, including Ray & Linda Fichthorn.